Prophecy involves a man (or, in the right context, a woman) speaking on behalf of God. The prophet receives a message from God and passes it on to the people concerned (Deut. 18:18; Jer. 1:9:17), frequently introduced by the words: ‘thus saith the Lord' (e.g. Isa. 7:7; 10:24; 28:16 etc.). In many cases, prophecy discloses future events, but not always. However, it does disclose God's mind at a given moment in time with regard to a specific issue or problem or person(s). Haggai, for instance, spoke primarily about present issues: lack of interest in, and zeal for, the house of God. But he also mentions the future glory of the house of God (in the millennium, Hag. 2:9) in order to encourage those who were building the temple at the time (see Q 2). 2. What is the purpose of prophecy? • Change the behaviour of those to whom the prophecy is addressed. • Occupy the hearers with Christ, with His sufferings, with His coming glory and with His role and position in times to come and in eternity. This is the key to prophecy (see 1 Pet. 1:11). 3. What were some of the common themes of Old Testament prophets? • The current behaviour of God's people: the sins of Israel and Judah, especially idolatry (see Isa. 44:9-22 among many other passages), social injustice (e.g. Jer. 7:5-7), lack of respect for God, and association with the surrounding nations. • The coming sufferings and glory of Israel (e.g. Jer. 31:1-36). The scope of prophecy is limited to events on the earth. This is why the Old Testament prophets did not speak about the church, which is heavenly, and its relationship with Christ, or the rapture. These were ‘hidden in God' as mysteries (Eph. 3:3-5,9; Col. 1:26; 1 Cor. 15:51). 4. Does the New Testament contain prophecy? • Prophecy concerning future events in the book of Revelation. Its great theme is the coming of Christ in power to take possession of this earth where He was refused by the majority of people when He came in grace (John 1:10). In preparation for this, terrible judgments will come upon this earth (chs. 6-19). 2 Thessalonians and Jude also contain prophecies about future events, as do other New Testament books (see Matt. 24; 1 Cor. 15; 2 Pet. 3; etc.). • ‘Prophetic writings' that make known the truth that was hidden in Old Testament times (Rom. 16:25, 26). • Prophecy in another sense: speaking the Word of God for the moment, in dependence on Him, for the edification of the assembly (1 Cor. 14). At the time when this epistle was written this included the communication of truth that had not been revealed before (see point a. above). Today, the Holy Bible is complete and, therefore, it is a matter of applying revealed truth to the conscience. It is not a matter of revealing truth over and above what is contained in the Bible. 5. Does Biblical prophecy actually happen? • fulfilments during Old Testament times e.g. Jeremiah's prediction of 70 years of captivity (Jer. 25:11, 12) and their restoration to the country after 70 years (Jer. 29:10; Ezra1:1), Isaiah's prediction of the coming of Cyrus (Isa. 44:28; 45:1), Daniel's predictions about the four world empires (Dan. 2; 4; 7), Isaiah's prediction to Hezekiah (Isa. 39:6, 7), etc. As a matter of fact, the fulfilment of a prophet's words was the test for his authenticity (Deut. 18:22). • fulfilments of hundreds (!) of prophecies relating to Christ's birth, life, sufferings, death and resurrection (see Mic. 5:2; Dan. 9:26; Psa. 22; Isa. 53 among many others; see also Q 12). • fulfilments after the time of Christ on earth (destruction of Jerusalem in AD 70, development of church history in Rev. 2 and 3, predictions about the end times (2 Tim. 3 etc.). There is no book in the world that can boast of – or that even claims to have – anything comparable by way of fulfilled prophecy. The precision and number of fulfilled Biblical prophecies can leave no doubt in any honest mind. Biblical prophecy has been – and the future part will be – fulfilled. 6. Should Christians contribute to the fulfilment of prophecy? This question may seem far fetched to some but in the light of movements such as ‘Christian Zionism' etc., it may be good to spell this out. The Bible does not encourage believers to try and ‘make prophecy happen'. God Himself watches over His Word and makes sure that it comes to pass (Jer. 1:12). In most cases there is nothing Christians could do to bring about the fulfilment of prophecy, and if they could it would only detract from God's glory and lower the significance of the fulfilment (it would be man's work rather than God's intervention). 7. What does prophecy tell us about the church? Nothing. The church is outside the scope of prophecy (except in the sense of New Testament prophecy, i.e. revelation of truth unknown until that point in time (see Q 3). 8. What are the main world empires predicted by prophecy? Daniel prophesied that the Babylonian Empire would be followed by three further empires (Dan. 2:37 -40). These are the Medo-Persian, Greek and Roman empires. See also Daniel 7 and 8. A number of other nations will play an important role in prophecy, such as Assyria (Isa. 10:5-12). More on this later in this series. 9. When was the start of ‘the times of the Gentiles'? The Lord Jesus used this expression in Luke 21:24: ‘ Jerusalem shall be trodden down of the nations until the times of the nations be fulfilled.' God had chosen one people, Israel, and had placed His throne in Jerusalem (1 Chr. 29:23). However, due to Israel 's unfaithfulness and idolatry, God allowed gave the rule and authority to the Babylonian Empire (Dan. 2:37; see also Q 8) to lead Israel into captivity. From this time onwards, the people of Israel have been dispersed among the nations and history reckoned with reference to heathen kings (see 2 Chr. 36:22). 10. How long will ‘the times of the Gentiles' last? As the question correctly implies the times of the Gentiles continue today. Israel is still dispersed; they still have not accepted the Messiah although their own prophets had spoken about him so clearly. But the time will come when – after a severe time of trouble – some among them will receive Him (Zech. 12:10 -14; Isa. 53). Then Christ will deliver them from their enemies (Zech. 14 and Mic. 5:5 and so on) and they will no longer be ‘trodden down by the nations' (see Q 11). Then the throne of Jehovah will be (in) Jerusalem once again (Jer. 3:17), see Q 9. 11. Is Israel still God's people – and will it ever be? There are two popular misconceptions about the people of Israel . One is that Israel, nationally, has no future, and the other is that they are already God's people and blessed by Him. The truth is that God had to dissociate Himself from the people He had chosen and had to declare them: ‘Lo-Ammi', meaning ‘Not my people' (Hos. 1:9). But as shown above (Q 10) they will repent and receive Christ, and then they will be recognised by God again as His people (Hos. 2:23). It is not difficult to understand that this cannot take place as long as they reject God's Son as Messiah. 70 periods of seven years. The idea of week–years was not uncommon to the Jewish mind: every seventh year was a Sabbath and every 50th year was a jubilee (Lev. 25:1-13). Daniel predicted that from the time of the command to rebuild Jerusalem it would last 69 weeks (i.e. 69 x 7 = 483 years) until Messiah would come, be rejected, ‘cut off', and ‘have nothing'. This is another instance of amazing precision in fulfilled prophecy (see Q 5). 13. How do we know that 69 weeks are fulfilled but the 70th is still future? in the first place, it is interesting that the 70th week is separated from the 69 preceding ones (Dan 9:26, 27). evidently, the events of the 70th week have not yet occurred (see Q 15 – Q 17). the time of the church is outside the scope of prophecy – as is the church itself (see Q 7). As the time of the church started only days (50) after the death of Christ (i.e. the end of Daniel's 69th week) and still lasts today we must conclude that, so far, there has been no room for Daniel's 70th week to occur. 14. When will Daniel's 70th week occur? After the rapture, at which point in time all believers will be taken out of this world. Then seven years of tribulation will occur (often divided into two halves of three-and-a-half years, especially in Revelation). 15. What will happen during the tribulation period? During the first three-and-a-half years of this tribulation period, God's providential judgements will fall upon the earth (famine, wars, etc., Rev. 6ff.). The last three-and-a-half years will be much worse – a time of unparalleled trouble: ‘For then shall be great tribulation, such as was not since the beginning of the world to this time, no, nor ever shall be' (Matt. 24:21). This is the great tribulation. This second half-week is spoken of as three-and-a-half years (or ‘times'), as 42 months, and as 1,260 days in Revelation 11–13 etc. Oppression will come from the Jewish ‘antichrist' and from the government of the re-established Roman Empire (the first ‘beast' of Rev. 13). In addition to this, God's direct judgments fall upon the earth (see Rev. 6-19). 16. What will happen to Israel during the tribulation period? The mass of the nation will become apostate and follow their leader, the antichrist (John 5:43, see Q 20). A small remnant, though, will be raised up by the Lord. Their trust in Him is expressed in the Psalms, and their suffering during this period is evident from Matthew 24:15-30; etc. They will preach the gospel of the kingdom to the whole creation (Matt. 24:14). 17. What are the main events that are to take place in the middle of this time? the Jewish sacrifices in the temple will cease (Dan. 9:27). antichrist (see Q 20) will sit in the temple and demand worship (2 Thess. 2:4). the ‘abomination of desolation' will be set up there (Matt. 24:15). 18. Will there be believers on earth during the tribulation? • Jeremiah 30:7 speaks of it as ‘the time of Jacob's trouble', so it relates to the Jews. • Daniel 12:1 speaks of it in connection with Daniel's people (Israel). • Matthew 24 refers to the same events as Daniel and, further, gives a number of additional proofs that the people concerned are Jews: the mountains of Judea, the Sabbath day, etc. • Revelation 3:10 is addressed to the church in Philadelphia, but states that the faithful will be kept from the hour of tribulation, not that they would go through it. • Revelation 7:9-14 then shows that the elders (of which the church is part) are a distinct class from those who go through the tribulation. All scriptures that mention the tribulation period therefore reinforce the same point: the saints who go through it are not part of the church; they are not Christians. See also 2 Thessalonians 2. 19. Who are the main actors during this time? Satan (presented as the dragon, in Revelation: 12, 13). The head of the revived Roman Empire (the first beast in Revelation 13). Antichrist (presented as the second beast in Revelation 13). In addition, there are the ‘king of the north' (the Assyrian), the ‘king of the south' (Egypt, etc.) the king of the utmost north (Russia), and a great army from the East (200 million strong, Rev. 9: 16). Antichrist will be the leader of the Jewish people during the tribulation period. This is his profile as given in Daniel 11:36-40: he will (i) be king, (ii) live in the time of the end, (iii) be king of Israel  . Further (iv) he is a Jew (as reference is made to the ‘God of his fathers'), and (v) He is apostate (no doubt about that, from verses 37.38). The false prophet (Rev. 16:13; 19:20). 21. Who is the dragon – and what does he do? The dragon that occurs in Revelation 12 as ‘sign' (v. 3) and stands for Satan (vs. 7-9). He is cast out of heaven in the middle of the seven-year tribulation period. Then the great tribulation of three-and-a-half years follows during which the dragon persecutes the Jewish remnant (see Q 25), the seed of the woman (Israel), (see vs.13-17). Thereafter, the dragon will be bound and confined to the abyss for 1,000 years, i.e. during the millennium (Rev. 20:1). Finally, he will be cast into the lake of fire (Rev. 20:10). 22. Where will the church be during the tribulation period? • The history of the church on earth (as public testimony) is described in Rev. 2 and 3. • In Rev. 4 and 5, the (true) church is already seen in heaven, bringing worship to the Lamb. At this point (the rapture) eternity has begun for the church. • As of Rev. 6, the judgements start to fall upon this earth. Being heavenly the church has never had a part in this world and hence is taken out of it before it is judged. • The fact that the passages that speak of believers in the tribulation period speak of Jewish believers, i.e. the Jewish remnant (Jer. 30:7; Dan. 12:1; Matt. 24), not about Christians. 23. Will there be a ‘second chance' for those who reject the gospel now? Definitely not. The Apostle Paul states in 2 Thess 2:11,12 ‘…God sends to them a working of error, that they should believe what is false, that all might be judged who have not believed the truth, but have found pleasure in unrighteousness'. Those who heard the gospel but rejected it will ‘believe what is false' and will ‘be judged'. Hence the solemn warning: ‘To-day, if ye will hear his voice, harden not your hearts' (Heb. 4:7). 24. What is the gospel of the kingdom, and who will preach, and who will accept it? The gospel of the kingdom, simply put, announces the imminent coming of Christ as Messiah, His authority, and the consequent need to repent. John the Baptist had already announced the coming kingdom: ‘Repent, for the kingdom of the heavens has drawn nigh' (Matt. 3:2). The Lord Himself preached the gospel of the kingdom (e.g. Matt. 4:23). As part of His great prophetic discourse on the Mount of Olives, the Lord foretold His disciples that this gospel of the kingdom would be preached again, not in a limited circle, but ‘in the whole habitable earth, for a witness to all the nations, and then shall come the end' (Matt.24: 14). This last phrase makes clear that the global announcement of the coming king(dom) will take place at the end, i.e. just before the Lord's appearing in power. This gospel will be believed by Jews who will be added to the ‘remnant' (see Q 25) and by a large number of people from various nations (Rev. 7:9-17). 25. What is meant by the ‘remnant', and how is it formed? Isaiah prophesied that a day would come when a ‘remnant' of the people of Israel would (1) trust in God, (2) return, and (3) be saved (Isa. 10:20 -22; Rom. 9:27). This remnant will suffer terrible persecution during the tribulation period (Rev. 12:17) but they will confess their sins and acknowledge Christ as the true Messiah (Isa. 53 and Zech. 12:10). Their soul exercises are vividly expressed in the Psalms. A remnant is smaller than the whole from which it is taken and it bears the features of the original (think of a carpet, for instance). But this does not imply inferiority in value. God values the minority who maintain the character of God's people. 26. Who is the King of the North? According to Daniel 11 the king of the north will invade Israel, besiege Jerusalem and then ‘come to its end' (v. 45). There can be little doubt that the king of the north is the Assyrian. This is suggested by its geographical location right in the north of Israel and by the fact that the Assyrian is also described as invading Israel, besieging Jerusalem and being defeated there (Isa. 8:78; 28:15, 18; Dan 11:40, 41). 27. What will he do, and how will he be defeated? Initially used as God's ‘rod' (Isa. 10:5), the Assyrian will act in great pride, invade Israel, continue through to Egypt victoriously, and then return to Israel and besiege Jerusalem (Dan. 40-45). Various prophets describe his invasion of the land of Israel as a great flood. As prefigured in Isa. 37 and 38, he will then be defeated by Christ (Isa. 30:30-33; 31:8; 59:19.20) but in association with the faithful remnant (Mic. 4:14 -5:8). Armageddon, which occurs once only in the Bible (Rev. 16:16), is thought to represent the Hebrew words ‘Har Megiddo', meaning ‘Hill of Megiddo'  . The valley of Megiddo in the north of Israel has been known as a battlefield in history (see 2 Chr. 35:22). Armageddon is the scene of the great final battle between the united armies of the earth and Christ (Rev. 16:12-16). When the sixth vial  of judgment is poured out on the river Euphrates the river dries up, which paves the way for the approach of the eastern armies, which are huge – 200 million strong – according to Rev. 9:16. Together with ‘the kings of the whole habitable world' (16:12), inspired by demonic power (16:13), they will go to ‘the war of that great day of God the Almighty' (16:14). The detail of what will happen when the world's armies are gathered together in Armageddon is given in Rev. 19:19, 20. 29. How will the tribulation period come to an end? By the Lord's appearing in might and power (Matt. 24:29-31). 30. What will happen at Christ's appearing? The Lord will appear, followed by the saints (Rev. 19, Jude 14) and His holy angels (Matt. 25:31) and judge those who oppose Him (Rev. 19; Isa. 30:30-33; 31:8). 31. Who or what are Gog and Magog? Gog is the future ‘prince of Rosh, Meshech, and Tubal' (most likely designations for Russia (Rosh) and its main cities (Moscow and Tubolsk, see Ezk. 38:3), and his land is called ‘Magog' (Ezk. 38:2). Gog, with his mighty armies, will invade the land of Israel with a view to plundering its possessions (Ezk. 38:10-12, 14-16). This will be at a time when Israel has been gathered together from among the nations (v.12) and dwells in the land in peace (v.11), i.e. after they have accepted Christ as their Messiah. But Gog's armies will come to a terrible end when God judges them through a range of terrible calamities (Ezk. 38:18–39: 8). The reference to Gog and Magog in Rev. 20: 8 speaks of a different event that will take place after the millennium (see Q 42). 32. How will the kingdom be set up? By the personal appearing and mighty intervention of Christ, attended by His holy angels and His saints (Mt. 25:31; Rev. 19:11 – 20:4). 33. Who will enter the kingdom? First of all, the Jews who will live at the time of Christ's coming in power and who will receive Him as Messiah (see Jer. 31; Eze. 38; etc.). The other nations will be judged by Christ. Those whose attitude and actions towards His people Israel were positive will enter the kingdom (Matt. 25:31-46). 34. How long will the kingdom last? The kingdom will last for 1,000 years – a time period referred to six times in Rev. 20:2-7. These thousand years are just as literal as the 1,260 days, the 42 months, and the 3½ years (‘times') in Revelation. At the end of this, Christ will return the kingdom – fully intact – to God (1 Cor. 15: 24). In this sense the kingdom will not end at all (Dan. 7: 14). 35. 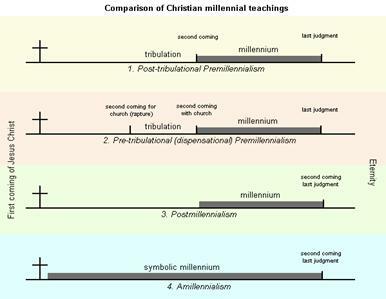 What are the main features of Christ's millennial reign? Under Christ's reign there will be righteous government, lacking for so long in this world (Isa. 11:3-5). Creation will be set free, and will not ‘groan' any more (Rom. 8:19 -22) so that the wolf and the lamb will dwell together (Isa. 11:6-8). The earth will be full of the knowledge of the Lord (Isa. 11:9). Satan will be bound in the abyss (Rev. 20:1.2) so that he cannot seduce men during that time. Finally, the Prince of Peace will reign (Isa. 9:6). 36. Will there be sin during the millennium? Yes, but only in isolated circumstances, and it will be subject to immediate judgment (Psalm 101:8). This shows that human nature, as such, has not changed and is still capable of sinning, even without the activity of Satan. 37. Will it be a literal reign on this earth? Absolutely. The biblical language is unmistakable  . The Old Testament is full of unfulfilled promised predicting that Israel will be gathered and the Messiah will reign on earth, e.g. Jer. 31:10; 32:37; Isa.11 & 24:23. These promises will be fulfilled literally, and have not been fulfilled in a ‘spiritual' way in the church. This is clear from several passages: Acts 3:19 -21; Rom. 8:19 -23; 1 Cor. 15:25; Eph. 1:10; Col. 1:20; Phil. 2:9-11, which were written after Pentecost and show that this future blessing remain outstanding, even after the formation of the church. 38. Is this really important? • Christ must be honoured and vindicated in the scene where He was rejected (see Isa. 52:14, 15; Phil. 2:8-11). • God's plan with this earth must be fulfilled: namely that a man should have dominion over creation (Gen. 1:28). Man failed and creation was plunged into greatest misery. But the true ‘Son of man' will fill that place (Ps. 8:6-9). • God keeps His promises: God had promised  to His people Israel to bring them back into the land from where they had been driven out and scattered, and that Messiah would reign over them there (see Q 37). And His promises will not be revoked (whoever else might receive blessing as well), ‘For the gifts and the calling of God are not subject to repentance' (Rom. 11:29). Amillennialism denies that there will be a literal millennium in which the promises given by God to Abraham (and to Israel) will be fulfilled (literally). Instead, these promises are spiritualised and thought to have been fulfilled in a ‘symbolical millennium' that started at Pentecost and that is thought to last until Christ's second coming in power. To see why Amillennialism is unscriptural and has serious consequences see Q 37 and Q 38. It robs Israel of its promises, the church of its hope and Christ of His Messianic glory. (2) the New Testament predicts, over and over again, that evil will spread and that last days will be bad days (2 Tim. 3:1.13; 4:3; 1 John 2:18; 2 Pet. 3:3; Matt.13:33). The world will be characterised by the progression of evil that will only be judged at the time of the harvest, i.e. that of the Lord's appearing (Matt. 13:30.40 and 24:29-31). This is a label that has been attached to the (biblical) teaching that Christ's coming in glory will occur prior to the millennium (see references under Q 38–Q 40). 42. What will happen at the end of the millennium? The final revolt, carried out by nations that are remote in relation to Jerusalem and that will be energised by Satan who will be loosed for a little time. But they will be judged by God's intervention, with fire from heaven (Rev. 20:7-9). Christ will hand the kingdom back to God, intact (1 Cor. 15:24). 43. Who sits on the Great White Throne? Christ Himself (see Rev. 20:11 and John 5:22). 44. Who will appear before the Great White Throne? Unbelievers only: those who are not written in the book of life (Rev. 20: 15). Although they are risen they are referred to as ‘dead' because this is their spiritual condition. 45. What is the lake of fire? The term ‘lake' suggests confinement and the ‘fire' speaks of judgment and torment. The beast (the head of the Roman Empire) and the antichrist (see Q 20, previous issue of T&T) will be cast alive into the lake of fire (Rev. 19:20) and later, after the millennium, Satan (Rev. 20:10) and the unbelievers who had died, as well as ‘death' and ‘Hades' (Rev. 20:15). Yes. See John 3: 36 and Mk 9:44, 46, 48. 47. What happens after the judgment before the Great White Throne? The created heaven and earth dissolve (flee away) and give way to a new heaven and a new earth (Rev. 21:1). This is the beginning of the ‘eternal state' (see Q 48). 48. What can we say about the eternal state? • All will be made new, God will dwell with men, there will be a new heaven and a new earth, no curse, no tears, etc. (Rev. 21:1-7). • God will be all in all (1 Cor. 15:28). 49. What is meant by ‘tabernacle' and ‘men' in Rev. 21:3? No doubt the same thing referred to immediately before this expression: the holy city, the new Jerusalem, the bride, i.e. the church. Even in eternity, the church will be distinct from the rest of ‘men' – although national differences that still exist in the millennium (Rev. 21:24, 26) will have vanished – and the church will enjoy a privileged position of special nearness to God in eternity, as His ‘tabernacle' or dwelling place. Why? Well, he will be in conflict with the king of the north and the king of the south (v.40). This is ‘north' and ‘south' relative to Israel. Further, he will give ‘the land' (= Israel, same expression as Ex. 20:12) to those who honour him (v. 39). Megiddo is a hill made of 26 layers of the ruins of ancient cities in a strategic location at the head of a pass through the Carmel Ridge, which overlooks the Valley of Jezreel from the west. Remember, the seven seals (Rev. 6 ff), i.e. the first waves of judgment, lead into the sounding of the seven trumpets (further judgments, Rev. 8:1ff), which give way to the final seven waves of judgments described as the bowls of the fury of God poured out on the earth (Rev. 16). Unless, of course, one takes the liberty to decide in advance that a literal reign of Christ cannot be meant and that, therefore, one has to spiritualise it and read ‘church' where it says ‘ Israel ' etc. But if we arbitrarily change the meaning of words, language ceases to be a meaningful tool of communication. This view is not incompatible with the use of symbolic language; where the context shows that language is symbolic it needs, of course, to be interpreted as such. How strange it would be to say that, instead, other people (the church) would receive different blessings (heavenly instead of earthly and spiritual instead of material) and to argue that this is a fulfilment of the promises.